This application note describes how the nanodac can be used to control the dosing level of a liquid or gas using the Feedforward feature of the PID algorithm to achieve an output proportional to the flow rate of the fluid. It is ideal for use on any application requiring up to four real universal inputs. An additional fourteen inputs can also be written to over communications effectively making an eighteen channel data logger. It also contains two PID control loops which can be configured to control process variables such as flow, level, pressure, temperature, etc,. In addition to the features listed above, the nanodac recorder provides powerful logging and secure archiving of the data. It can store information in either open CSV format or in a secure (UHH), check summed format to protect data integrity. The archive data includes actual values from real or communications channels (PV), Alarm Messages, and Operator Input Messages all of which are accurately dated and time stamped from the on-board real time clock. Dosing or residual control, as it is also known, is the name given to the technique for controlling the addition of a substance to a flowing liquid or gas. Typically a dosing system is designed so that the required dosing level can be achieved by maintaining the control signal as a proportion of the fluid flow rate. The dosing (or residual) level is used by the control algorithm to trim the output signal by the required amount. Any industry that mixes substances into flowing fluids potentially has the requirement for this type of control. These include the water, brewing, distilling, china clay, concrete, paper and soft drinks industries or any process requiring disinfection in cooling towers, food and beverage, drinking water, wastewater and swimming pools. The figure shows the general arrangement of the dosing control system which in this example uses chlorine as the dosing additive. The main fluid flow is measured upstream from the dosing pump and the chlorine level is measured downstream. The feedforward feature in the control loop is used to achieve an output proportional to the fluid flow rate. This means that the dosing rate immediately tracks any changes in the flow rate and so avoids over or under dosing. The dosing concentration, measured downstream, can be used to provide closed loop PID control action to trim the fed forward output. As the flow rate varies so will the transport delay of the control loop. To compensate for this, the integral time of the controller should be increased as the fluid flow rate reduces. This is achieved by using the Gain Scheduling feature of the nanodac recorder/controller. Three sets of control parameters are available, the active set selected according to the flow rate. In some cases the dosing level to be controlled is well downstream from the dosing pump, maybe by as much as 30 minutes at normal flow rates. 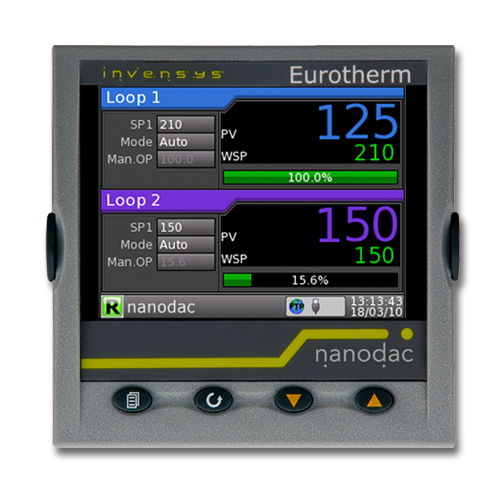 In these cases, providing the dosing level can also be measured much closer to the pump, then the second loop in the nanodac recorder/controller can be used in cascade. The master loop controls the dosing level at the point further downstream. Process feedforward can still be used to compesate for flow rate changes. In this example, dosing level is measured using channel 1 configured for 4-20mA input. This is connected to the main PV input of the control loop. The flow rate is measured upstream using channel 2 configured for 4-20mA input. This is connected to the Feedforward input of the control loop. The Control output is connected via Output Module 3. This is assumed to be 4-20mA in this example but other outputs (such as on/off) may be used to match the type of pump in use.